Media captionLiam Fox on tariffs between the UK and the EU after Brexit. The UK's trade with the European Union will be "at least as free" after Brexit as it is now, Liam Fox says. The International Trade Secretary said it was in other countries' interests to avoid tariffs which he said would "harm the people of Europe". He also predicted the UK would be a standard-bearer for global free trade and that Brexit represented a "golden opportunity" to forge new links. Lib Dem EU spokesman Nick Clegg said Mr Fox was "delusional" about Brexit. 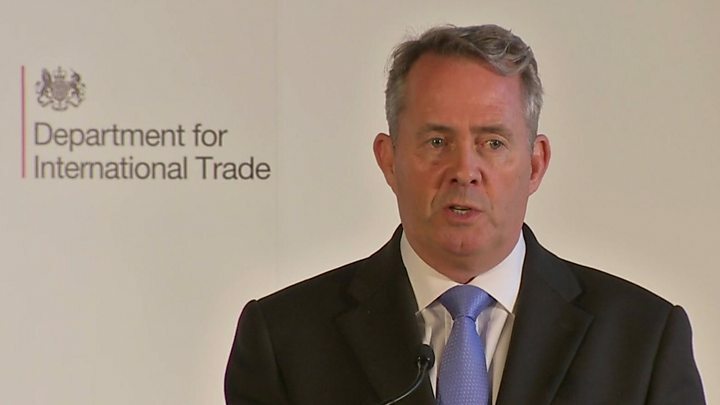 The UK is unable to negotiate trade deals independently while in the EU so Mr Fox will be negotiating new arrangements with other countries after Brexit, and has already had some talks with countries such as Australia. Reality Check: Would EU or UK lose most from tariffs? In a speech in Manchester, he said free trade had "transformed the world for the better" and that the UK had "a golden opportunity to forge a new role for ourselves in the world" in the "post-geography trading world" as a member of the World Trade Organization (WTO) - the body which helps sets rules for trade between different countries. He said: "As a newly independent WTO member outside the EU, we will continue to fight for trade liberalisation as well as potentially helping developing markets trade their way out of poverty by giving them preferential access to our markets. "I believe the UK is in a prime position to become a world leader in free trade because of the brave and historic decision of the British people to leave the European Union. "We are leaving the EU, we are not leaving Europe and we are ready to take our place in an open, liberal and competitive globalised trading environment." Asked afterwards whether he was concerned about tariffs being put in place, he said: "Who does it harm more if we end up in a new tariff environment? "Does it harm more those who sell more to the UK, or the UK? It's in everybody's interests that, as we move forward, that we have at least as free a trading environment as we have today." Mr Fox also defended his recent comments that Britain was "too lazy and too fat" with businessmen preferring "golf on a Friday afternoon" to trying to boost the country's prosperity. "What I said was as a country we have been too willing to rest upon the achievements of previous generations," he said. "I think the figures speak for themselves." The former GP added: "When I was a doctor my job was not to tell people what they wanted to hear, it was to tell people what they needed to hear in order to put things right." Liam Fox is aiming high. The international trade secretary told an audience of business leaders in Manchester that when Britain leaves the EU, he wants it to have a trade environment with European economies that is at least as free as it is now. Anything else, he said, may not harm the politicians and institutions in Brussels, but it would harm the people of Europe. He also said for the first time that he wanted a post-Brexit Britain to be a full independent member of the World Trade Organisation, a clear signal that he does not believe the UK should seek what's called a soft Brexit involving membership of the EU single market or customs union. Mr Fox's argument is that EU leaders won't want to impose punishing new tariffs on British goods and services for fear of harming their own economy. But hoping for a trade deal with the EU as good as it is now will be seen by some as highly optimistic. But Mr Fox was criticised by former deputy PM, now Lib Dem EU spokesman Nick Clegg. He said: "Liam Fox is delusional about the impact of Brexit on British trade with the rest of the world. Unbelievably, he claims to be 'taking an axe to red tape across borders'. "The truth is that leaving the EU's customs union and single market will bring a deluge of new Brexit red tape down on the heads of British businesses who export to the continent." Labour MP Pat McFadden, for the Open Britain campaign which pushes for a close relationship with the EU, said: "Today's speech took us no further in terms of setting out a government plan of how to secure as good and free access to our biggest market as we currently have." Ben Digby, international director at the CBI, said it was "encouraging to see the government make a robust case for free trade". He added: "Redefining our economic and trading links with Europe must be the first priority, as the continent remains our biggest trading partner and the terms of our exit from the EU will help to shape what future trade deals look like." The government has yet to set out its negotiating position. Key issues include the balance between single market access and accepting the right of EU citizens to freely move to live and work in the UK. In a BBC interview, Italy's prime minister said it would be "impossible" for Brexit talks to result in a deal that gives Britons more rights than others outside the EU. Matteo Renzi warned that leaving the EU would be a "very difficult process" - but the problems could be solved only after the UK began the exit procedure. Markus Kerber, the head of the influential BDI which represents German industry, said a so-called "hard" Brexit, rather than a "fudge", was the only option and predicted the UK would not secure full access to the EU single market if it wanted to curb migration. He told BBC Radio 4's Today programme the British government appeared to want "relatively full access to the single market and yet limited on non existing freedom of movement of labour". "That I think is impossible at the moment, so what we think the British government wants I can tell you straight away is not what the continental Europeans are willing or even able to give, then it will be relatively short negotiations," he added. The issue is likely to dominate the Conservative Party conference which begins on Sunday. Prime Minister Theresa May has said she will not formally trigger Brexit this year but faces calls to clarify the government's demands. Former education secretary Nicky Morgan, who campaigned for Remain in the referendum, told the BBC the PM could give a "broad outline" in her conference speech and called for details to be provided "in the next couple of months". "Nobody in the government has the first idea of what they're going to do next on the Brexit front," he said.